At least 23 people have been killed in attacks by Syrian government troops on a rebel-held enclave on the outskirts of Damascus, a monitoring group says. The UK-based Syrian Observatory for Human Rights (SOHR) said several towns in Eastern Ghouta were hit by air strikes and artillery fire. Meanwhile, Syria's state-run media said four people were injured in a rocket attack on Damascus's al-Midan area. Neither of the two reports have been independently verified. 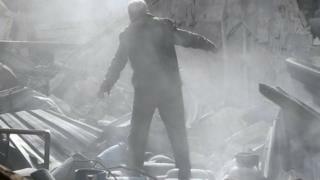 On Sunday, the SOHR said that children were among the victims of the government attacks in Eastern Ghouta. It said that more than 120 people have been killed since the Syrian army began its offensive on the rebel enclave nearly two weeks ago. After years of siege, conditions for Eastern Ghouta's 400,000 residents are dire. Several people are reported to have died of starvation. In a separate development, Russia, a key ally of Syrian President Bashar al-Assad, said its warplanes carried out air strikes on positions of Islamic State (IS) militants in the eastern province of Deir al-Zour. It said IS strongholds and a number of militants were hit. Earlier this month, Syria announced that its troops had retaken control of Deir al-Zour - the last IS stronghold in the country.